It is Art Market's 12th year running! 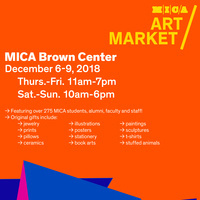 Stop by the Brown Center and get ahead on your holiday shopping with handmade gifts created by over 300 MICA students, staff, faculty, and alumni! We can't wait to see you there! Have a beautiful holiday season!